Why are Mosquitoes More Attracted to Some People than Others? Nathan K. asks: Is it true that mosquitoes are more attracted to some people than others or does it just seem that way? Female mosquitoes can put a damper on any outdoor event when they start to snack on those present. (Note: only the females drink your blood; they don’t need it for their own nourishment, but for certain nutrients necessary to develop their eggs). Certain people seem to be swatting the insects away or ending the night with more red bites than others. So is it true that some people really are more “attractive” to mosquitoes, and, if so, why is this the case? To answer the first question- yes, some people do attract mosquitoes more than others at certain times. As for the answer to why this is the case, there are numerous factors involved. Beyond the several hundred chemical odors that have been identified to date that the human body gives off (some of which singularly, or in combination with others, attract or repel mosquitoes), there are also over 3500 types of mosquitoes, not all of which are attracted to or are repelled by the same things. Needless to say, why mosquitoes seem to be more attracted to one person over another at a given time is very difficult to discern. That said, in general, we know definitively that seemingly all female mosquitoes identify you as a potential target for a blood meal via the carbon dioxide your body puts off, which they detect via their maxillary palp organ. In fact, mosquitoes can detect you this way from up to about 100-150 ft (~40 meters) away. This is one of the many reasons mosquitoes tend to target people who are in the middle of exercising more- when you’re working out and breathing hard, you’re giving off more carbon dioxide than you otherwise would in your resting state. This also contributes to overweight or otherwise larger individuals being more targeted by mosquitoes than their slimmer or shorter brethren- the more body mass, the more oxygen the body needs to maintain it and the more carbon dioxide the individual will give off. Essentially, the higher your metabolic rate, the more carbon dioxide you give off and the more you’ll be (at least initially) attractive to female mosquitoes looking for some blood so they can make baby mosquitoes. This is also one of the reasons why children are usually less likely to be bitten by mosquitoes than adults, and men more likely to be bitten than women. Another contributing factor to people exercising being more likely to be bitten is body heat- the higher your body heat, the more likely a mosquito is to notice you. This is also generally hypothesized to be a potential reason that people who are drinking alcohol are more likely to be bitten. However, it should be noted that it’s a myth that drinking alcohol raises your body temperature. In fact, the opposite happens; the age old remedy for staving off extreme cold via drinking alcohol actually makes it more likely you’ll get hypothermia, as alcohol cools your body off. Drinking alcohol does make you feel warmer because it dilates your blood vessels, particularly the capillaries under the surface of your skin. Thus, the volume of blood brought to the skin’s surface increases, making your skin a lot warmer, and sometimes more sweaty. These two factors may result in you being more attractive to mosquitoes, at least as far as this commonly touted hypothesis goes. That said, in one study looking at the effects of alcohol consumption on mosquito attractiveness, Alcohol Ingestion Stimulates Mosquito Attraction, while, as the title of the paper suggests, they did find alcohol consumption significantly increased one’s chances of getting bitten by mosquitoes, contrary to prevailing wisdom, they found “ethanol content in sweat and skin temperature did not show any correlation between alcohol ingestion and mosquito landings.” It should be noted though that this particular study was performed using an exceptionally small sample size of only 13 individuals. But the bottom line with this one is that several studies indicate that alcohol consumption very much does appear to increase the likelihood of being bitten by mosquitoes, but, as with so many of the known attractants, exactly why this is the case is still a matter of debate. Pregnant women are also more attractive to mosquitoes (statistically almost twice as likely to be bitten than the rest of the general populace). The culprits in this case are generally thought to mirror those of exercisers: carbon dioxide and heat. Pregnant women exhale on average about 21% more carbon dioxide than when they are not pregnant. Their body temperature is also typically slightly higher than non-pregnant individuals, particularly around the belly. Another factor that potentially attracts mosquitoes from afar is clothing color and movement. While it’s not completely understood why mosquitoes are more attracted to people wearing darker colored clothing, the general hypotheses put forth are that it may have something to do with making you stand out more on the horizon (mosquitoes tend to fly low to the ground to stay out of the wind as much as possible) and it may also have something to do with heat, with dark clothing absorbing more sunlight. Moving around is presumed to make you more attractive to mosquitoes via motion allowing the mosquito to better distinguish your body from the surrounding environment. So that’s the initial attraction. Just because a mosquito is attracted to you from afar, once they get close up (and even after they land), they may actually decide not to bite. After all, an idling car gives off plenty of carbon dioxide and heat, which will initially attract a mosquito, but once up close, the lack of other markers will let it know it’s not a potential blood source. 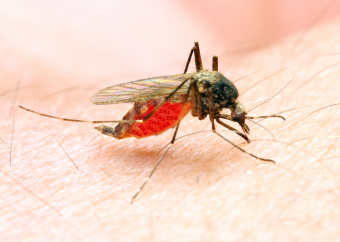 The factors involved in whether a mosquito will decide to land and then whether they decide to bite essentially comes down to your general scent and then taste, both in terms of certain chemicals attracting the mosquito even more and others potentially repelling them. How sweaty you are at a given moment, and what exactly is in your sweat, will greatly influence these attractive and repellent factors, with such markers as lactic acid, uric acid, and ammonia being among the compounds in your sweat and other skin excretions that attract mosquitoes. On the other hand, those who naturally excrete the compound 6-methyl-5-hepten-2-one have been found to be significantly less likely to be bitten owing to this compound acting as something of a mosquito repellent. It also appears that the blend of microbes living on your body also effects how attractive you are to at least certain types of mosquitoes, although research into this is also pretty scant at this stage. That said, in one 2011 study, Composition of Human Skin Microbiota Affects Attractiveness to Malaria Mosquitoes, they found that more diverse colonies of microbes on your skin actually seems to repel mosquitoes, whereas a high density of just a small number of certain microbes, such as Staphylococcus spp, seems to attract them. Beyond certain people actually being more attractive to female mosquitoes than others, there’s also the fact that some people are more reactive to mosquito bites. After the mosquito has drunk her fill of your blood, she leaves behind the cocktail that is her saliva. Your body’s response to this foreign substance is to produce a variety of antibodies to bind to the antigens in the saliva, which in turn releases the nitrogen compound histamine. Why this is a good thing most of the time is that histamine helps your white blood cells and other proteins engage whatever is invading your body by making the capillaries of these cells more permeable. The downside in the case of mosquito bites is that this triggers an inflammatory response causing the bite region to swell into a nice pink bump. If you scratch this bump, this irritates and inflames the area even more, resulting in your immune system kicking into overdrive to try to get rid of the foreign substance. So this means more inflammation for you, resulting in an ever swelling, itchy bump that just won’t go away. For some, their body’s histamine response is minimal, meaning they may not even be aware they were just a blood meal for a mosquito. For others, every bite becomes swollen and itchy. So if one person’s body doesn’t really react much, or at all, to a mosquito’s bite, that person may think they’re one who isn’t very attractive to mosquitoes even though they may be, and vice versa. Do Earwigs Really Lay Eggs in Your Ears? Does Bumblebee Flight Really Violate the Laws of Physics? Are some people more attractive to mosquitoes? You Asked: Why Do Mosquitoes Always Bite Me? Why Do Mosquitoes Bit Some People More Than Others? You got the sulcatone/ 6-methyl-5-hepten-2-one backwards, it attracts mosquitoes more.